Does your commercial property’s landscaping need to be improved? While most people realize that curb appeal is important to cultivate for homes, many forget that it is equally important for businesses. If your property regularly receives customers, potential new hires, or other visitors, you want to ensure that you are making a great impression. Your commercial landscaping sends a message to people about you and your business — and you want to make sure it’s the right message. In this article, we’ll go over some quick commercial landscape design ideas for your building. These ideas will help you start thinking about and determining what kind of message you want your commercial landscaping to send. When you start thinking about the landscape design for your commercial property, one of the things that you should prioritize is your external signage. If you have a roadside sign, then it’s important that you accentuate it with attractive landscaping features to help catch the eyes of passing customers. You want to make sure that your business stands out and is easy to find for clients. Your signage will be one of the first things that a customer will see, so it should be easily visible and attractively highlighted. If you have signature brand colours in your logo, adding a few splashes of matching colours throughout your flower beds is a great way to help your commercial property stand out from your neighbours. Bright flowers are a welcome addition to many commercial landscapes, especially annuals and perennials. Make sure that you pay attention to soil and light conditions for your property, as you want to pick flowers that will thrive in order to avoid the costs associated with updating your landscaping on a regular basis. Make sure that your landscape design complements the style and natural contours of your building. If you have a beautiful windows or a wide entranceway, you want your landscaping to frame and highlight these features for your guests. Your landscape design should also fit the architectural style of your building. For example, if your building has a sleek, modern look to it, you may want to avoid overly colourful flower beds and choose a more minimal design instead. 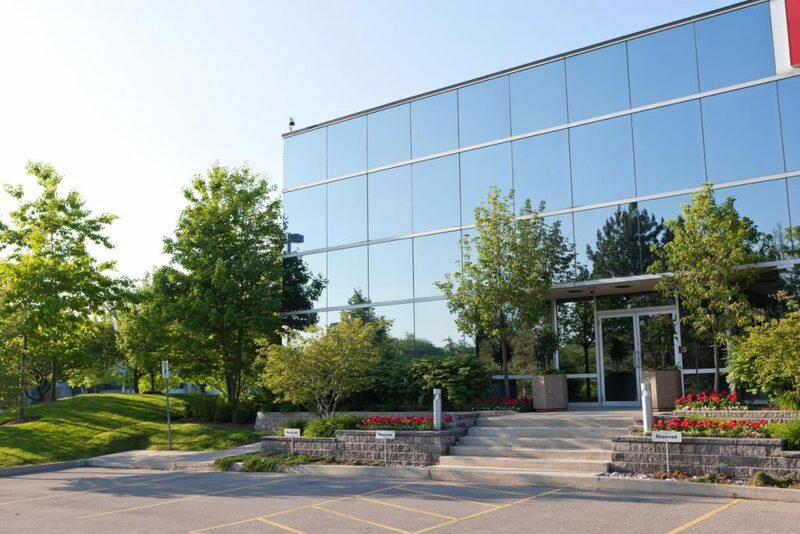 Ensure that your landscaping matches the architecture of your commercial property and accentuates its best features, rather than hiding or detracting from them. As much as you want to enhance your commercial property’s curb appeal with beautiful features, you also want your landscaping to be functional. Your landscaping should help direct new visitors to the most important parts of your building — likely the main entrance — as well as helping them find appropriate parking and drop-off spots. One easy way to direct traffic is to create walkways with rows of plants, trees, or flower beds that direct them from the parking lot to the entrance. You can also use retaining walls and hedges to block the line of sight on areas where you don’t want visitors to go, or that are for employee use only. One important design tip for a commercial property is to keep parking lots separate from the main entrance, or have different visitors’ and employees’ lots. 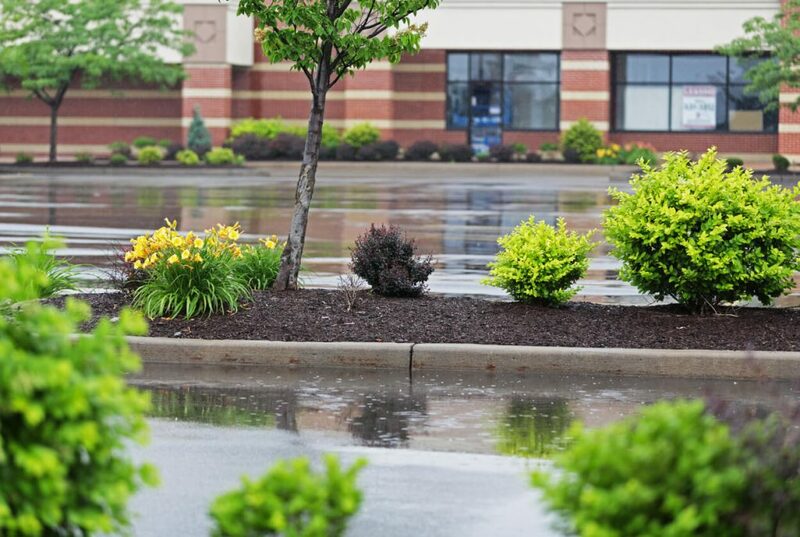 Parking lots can be a eyesore for many people, so you may want to consider hiding your parking spaces out of sight behind shrubs, retaining walls, or other landscaping features, in order to improve your visitors’ experience. Of course, if you have a retail business, then you will want to do the opposite and prioritize accessibility. In this case, you should make sure that your parking lots are the first thing that visitors will see. Whatever the case, one thing that’s important is parking lot maintenance. Asphalt parking lots in Canada, in particular, are prone to getting potholes and suffering from cracking during the winter. Make sure that your parking lots are kept in good repair and any hazards to drivers are quickly fixed. In the end, your landscape decisions need to be flexible, depending on your industry and the goals you’re trying to achieve with your landscaping. They fit into the natural landscape. They are well-suited for the climate. They require less upkeep from your maintenance team. Selecting native plants for your landscape design will send a message to customers about your company and will help your landscaping become more self-sustaining. When considering your landscape design, the most important thing is for your design to reflect your company and its value. Think about the message that you want to send to prospective customers, visitors, and employees. What is important to you and how should your property reflect this? Do you want to be seen as an environmentally-friendly company? If so, then make sure that you are selecting native plants that will be easily sustainable and that you are incorporating green features, like rainwater reclamation devices and solar panels. Are you trying to present yourself as focused on quality or professionalism? If so, then your lawns, gardens, and flower beds should be professionally maintained, in order to give that same impression to your visitors. We hope that these commercial landscape design ideas have been helpful! If you’re looking for help with your landscaping and property maintenance, contact the team at Nu Image today.